Now RS232 interfaces is still used in the communication between a lot of devices, its’ single-ended signal transmission determines the distance of communication can only reach about 30 m, and has shortcomings such as low rate, poor anti-interference capabilities, not easy to facilitate networking and so on. The adoption of the popular "RS232 long-term transceiver (serial pump)" can extend the communication distance to 2 km (9600bps), but the communication rate is not satisfactory and it only applies to point-to-point communications, not network. The CAN-232G light-isolated ultra-long-range driver witch is developed by Fourstar completely solve the problems above. We use the CAN (Controller Aera Network) bus technology witch does not change the RS232 commuunication protocol to extend the RS232 communication distance to 10 km, and solve the power need of using repeater in field. And the use of RS232 interface network is high-speed and convenient. can ensure it suits for all the RS232/RS485 software without changing the original software. 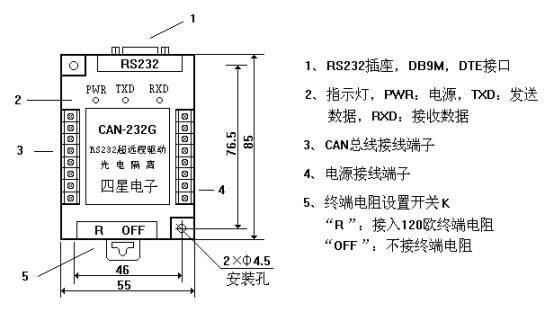 As shown, the RS232 signal of the equipment convert into TTL level through RS232 interface circuit., the equipment will not receive the signal witch is sent by its own and the CAN signal witch is output by CAN bus driver after photoelectric isolation. The working power of this product can be provided by the equipment or obtained separately from external. Isolated power modules are used in the internal of the product, the signal and power is isolated to ensure the safety of anti-jamming performance of the system. 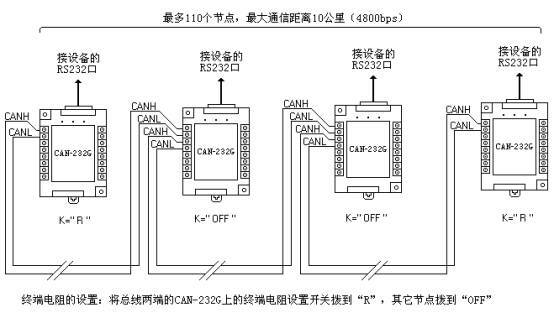 Description: The two pairs of CANH and CANL terminal is to facilitate the connection with bus in networking. This product has provided two optional external power-input channels. The power terminals and connecting the 1-pin and 5-pin of RS232 socket to 5V Power both work. They are very convenient for some RS232 mouth witch is with 5V power-supply equipment (such as PLC). For other out standard RS232 ：Connect send with receive, receive with sent, ground with ground. For RS232 of DB25:9―25 transferred connection is needed. 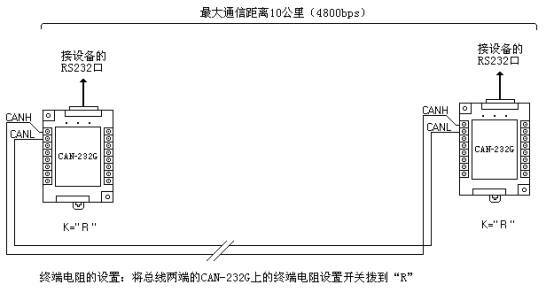 CAN-232G can realize the multi-machine communication network witch is composed of 110 RS232 nodes; the largest communication range is 10 km (4800bps). The address of each node is determined by the procedures in the equipment. 2, When use shielded twisted pair, please connect the shield to the "FG" terminal of CAN-232G, and to land finally. 3, The cable’s length of CAN-232G to bus(extension) cannot be more than 15 m, otherwise they will have echoes, affecting the normal communication of system. Of course, there will be no extension problem if you use two pairs of CANH, CANL video for connection as the map showing. 4, For the setting of terminal resistance, the role of terminal resistance is to eliminate the waveform distortion caused by the reflection of signal in the communication lines. 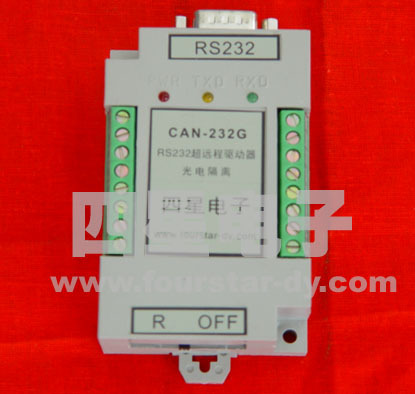 Please turn the termination resistor setting switch K witch is on the CAN-232G of the communication line’s terminal and start to "R" (connect 120 Ohm terminal resistance), the terminal resistance setting switch K of other CAN-232G to "OFF" (terminal resistance is unacceptable). 6, the products provide two external power-supply channels, one is terminals, and the other is 1-foot and 5-feet of RS232 socket (This is very convenient for connecting RS232 interfece witch are with power, such as PLC). The user may Choose one of them according to the equipment’s situations. The external power can be taken from equipment, such as the computer's USB port. You can also use a separate power supply.